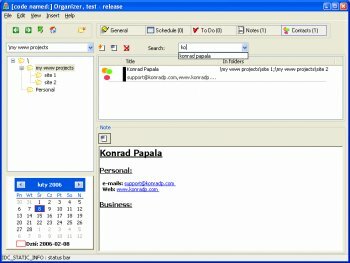 Total Organizer is a Personal Information Manager allowing you to store your tasks, todos, contacts and notes divided into tags (folders). Just started using the trial Pro version and I must say I am very impressed. The ability to cross-reference to-do tasks with, for example, contacts is very intuitive. For example, I am self-employed, so I have a folder with Customer contacts. In that folder I have created two subfolders - Payments Due, and Payments Received. If I do a job for a customer but don't receive payment straight away then the task is itemised in Payments Due, simply by clicking on the Payments Due folder on the left hand side. As soon as I receive the cheque for that job I can go back to that task and click once on Payments Due, which removes the cross-reference from the Payments Due folder, and then click once on the Payments Received folder. Voila!! Payment is now recorded under payments received! Yes I know there are accounts packages that do this but I am mobile in my work, and I can't take my accounts software with me and install it on every computer I fix. This program is portable, so I can bring it around and keep myself organized. Very very good indeed! Just what I have ben looking for, and definitely a step above the others I've tried. I'm constantly working on Total Organizer and any problems are solved very quickly. I gave it a 5 before but I got to take a point off. Theres somethings that went wrong: like some reminders that got placed at another date. I use it daily, I love it. Very interesting, indeed. The challenge will be to keep it from morphing into bloat. I downloaded this with very low expectations. I am very pleased. It has all the features I want in an organizer (notes, address book, to-do, and scheduler/reminder) and takes little resources. it certainly looks promising. it is heading in the right direction as far as an "organizer" software is concerned. the layout is simplistic enough to be appreciated as it is. The features are lacking (well, it is to be expected since it is a beta, after all).